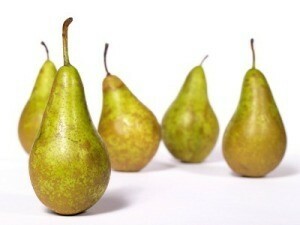 You can use delicious fresh pears or canned ones to make delicious desserts. This page contains pear dessert recipes. Peel, remove core, and dice the apples and pear into small pieces. Add lemon juice and water (or apple juice) Simmer on low in a small saucepan until soft, about 20 minutes. Mix first 4 ingredients and bake at 375 degrees F in 7x11 inch pan for 15 minutes. Make into crumbs when cool. Combine brown sugar, flour, and salt. Blend in pear juice and milk until smooth. Cook over medium heat, stirring constantly, until mixture thickens and comes to a boil. Boil 1 minute. Remove from heat. Gradually stir hot mixture into beaten eggs until all is added. Boil one minute longer. Blend in butter and vanilla. To serve, use crumbs, then filling, then whipped cream over top and add a pear dipped in sugar and cinnamon on each serving.